Our Tip Shop in Newport and The Shed in Llantrisant both hit the news this morning (28.11.18). 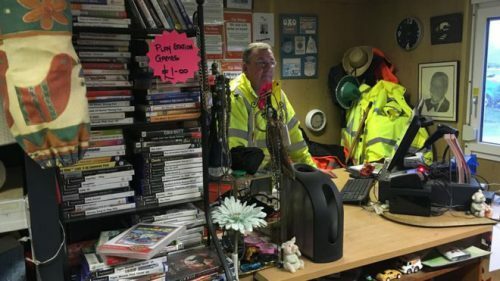 The idea of saving stuff from skips and reselling it to raise money for our social programmes seems to have caught the imagination of the mass media. Earlier this month it was ITV broadcasting live from The Shed – this week the BBC took up the story. John Williams (Assistant manager Tip Shop) contemplates his figures for the day. BBC stories like this are carried across all their platforms, so it was on the radio, TV and online (click here). When we work with the media we try to emphasize the importance of our volunteers and the social aspect of our work as well as the tonnes of stuff we stop from going to landfill. It’s a complex and sometimes tricky subject as some of our volunteers have learning difficulties. These volunteers deserve as much credit as others in Wastesavers, but it can be particularly challenging for a news editor putting together a 20 or 30 second piece. This kind of publicity, however, really helps. The Shed saw a significant upturn in visitors the following days after the ITV broadcast, and we hope for the same effect on the Newport Tip after today’s coverage. The mass media comes in for a lot of criticism these days, but news editors are aware that viewers and readers want good news stories. The hard news (war, deaths etc) has to come first and people would complain if it were not covered, but there is still time and space for softer stories like ours. So a thank you to BBC and ITV Wales for taking up our story and those of our volunteers – without whom non of this would have been possible.